The Flight Tracker widget in OS X El Capitan, shown in the following figure, can find flights on most airlines and report the flight’s status in real time — a terrific timesaver when you have to meet a flight. 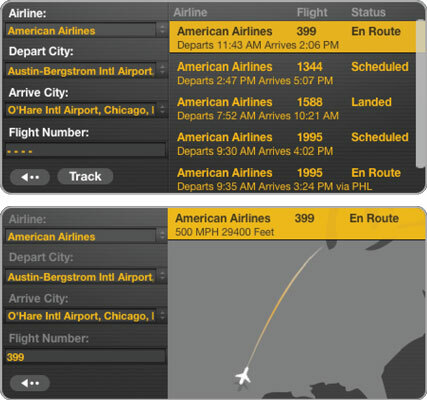 Finding a flight (top) and viewing its status (bottom). When you have to meet someone’s flight, this widget can be a lifesaver. Just open Dashboard every few minutes, and you know exactly what the flight’s status is at that moment. This is a really good tip for harried air travelers: You can open more than one instance of a widget. So if you’re trying to track more than one flight, or you want to know the weather or time in more than one city, just click the appropriate widget on the Widget Selection Screen, and another instance of it appears.